There’s nothing like having a refrigerator in your van to really bring the comforts of home on the road. Refrigeration means you can store fresh food and other cold items – like vegetables, dairy, meat, “booch,” and beer. It means you don’t have to fuss with a cooler full of ice and water-logged food. And even though campervan refrigerators aren’t cheap, having one means saving money (and eating healthier) by cooking your own meals. A good 12V fridge is one of the biggest investments you’ll make when building your van. And when you’re throwing down that much money on one thing, you need to know that the fridge you’re getting will meet your needs and hold up to the daily grind of life on the road. For this post, we spent weeks researching refrigerators. We looked at units from ARB, Dometic, Engel, Whynter, Norcold, and TruckFridge. We analyzed reams of information on sizes, models, warranties, and power draw. We even contacted manufacturers directly to ask questions when we couldn’t find answers. We took all of this info and compiled it into a massive spreadsheet for you to examine on your own. And now we present you with our recommendations. In our opinion, the Dometic CFX line of portable fridges are the best 12V fridges for vanlife. CFX fridges will keep your food cold with a minimum of power draw, they have some cool features that other fridges don’t, they’re very rugged, and they offer good value for what you get. There are other great fridges out there – but the more expensive ones don’t perform any better, and the cheaper ones sacrifice efficiency and reliability. Dometic CFX fridges are the best combination of efficiency, features, price, and reliability that we’ve seen. 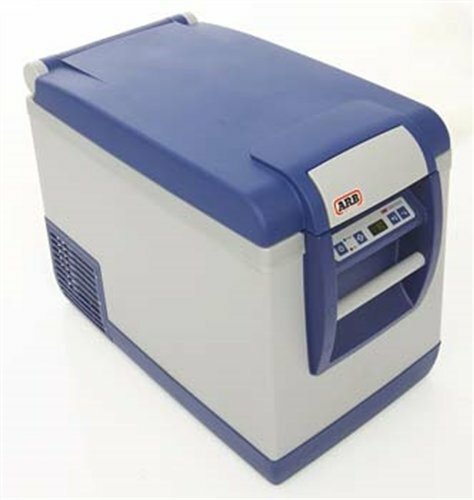 ARB’s portable 12V fridge/freezers are excellent, and they draw a very low amount of power (this fridge is one of the top performers that we looked at). ARB fridges are designed for 4×4 expeditions in the Australian outback, and they can withstand just about anything you can throw at them. We personally own the ARB 50-Qt model, and we absolutely love it. ARB fridges are tops in efficiency and durability, but our number one pick Dometic fridges also perform well and we think they’re a better overall value. Chest-style vs. Upright Fridges: What’s Best for Your Build? How Much Electrical Capacity Do You Need to Run a Fridge? Compressor fridges are the most common type of fridge you’ll see on the road, and for good reason. These fridges are often designed for use in 4×4 vehicles and boats, and they’re built with durability and efficiency in mind – two things you really need in an off-grid adventure vehicle. In terms of fridges, there’s really no other option worth looking at. Compressor fridges are just perfect for vanlife. 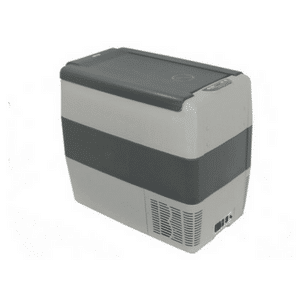 They have highly efficient, variable speed compressors that draw very little power, they can be used as either a fridge or a freezer, they come in a variety of configurations – including chest-style, upright, and dual-zone fridge/freezers – and they typically have the ability to run while at an incline of up to 30 degrees (other types of fridges need to be kept perfectly level when running). Even though compressor fridges are awesome, they do have a downside – cost. Portable 12V fridges are more expensive than other options, and that’s before you factor in the need to add auxiliary batteries and a means to charge them (like solar panels or a battery isolator). 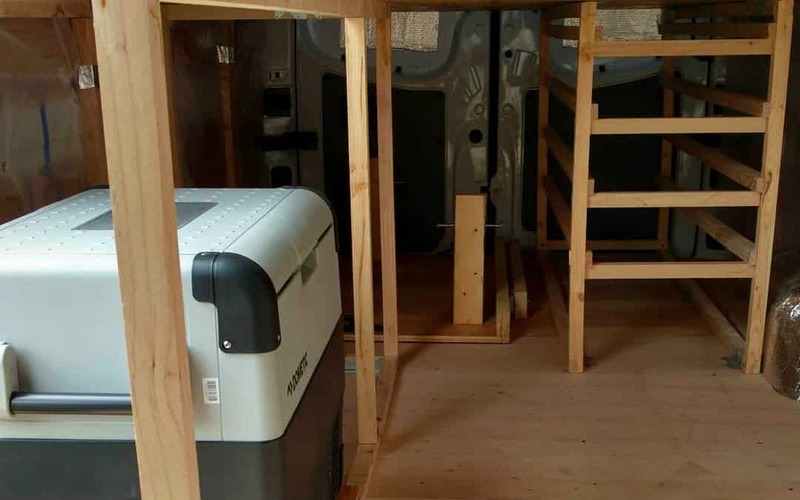 But if your goal is to turn your van into a comfy, off-grid mobile dwelling, investing in a high quality 12V compressor fridge is totally worth the cost. 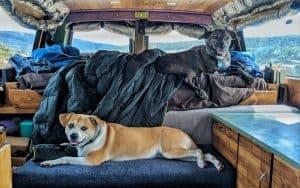 If you’re just beginning your vanlife journey and don’t want to throw down for an expensive fridge and electrical system right away, then a good cooler can get you started for a minimal cost. Many high performance coolers can hold ice for 5-10 days, giving you plenty of time off in the wilderness before you need to restock. Coolers do have many drawbacks that make them less than ideal for full time living. The cost of ice adds up over time, making coolers a more expensive option over the long haul. Not to mention all the time and effort it takes to hunt down ice when you need it, periodically dump out any ice melt, and deal with potentially water-logged food. But if you’re a weekender, or if you’re just testing out this whole vanlife thing, or if you’re on a shoestring budget – then a good cooler is the best option for keeping your food cold on the cheap. Remember, you can always upgrade your van down the road as your needs and budget change. Thermoelectric coolers plug into a 12V power source, and have the ability to chill their contents without ice. But they’re just not ideal for living in a van. Thermoelectric coolers only have the ability to cool 40° or less below ambient temperature – which is fine if you spend all of your time in cool weather, but if the outside temperature is above 78° you probably won’t want to store meat or dairy in one. They also draw much more power than 12V compressor fridges, making them tougher to run on an off grid electrical system. And, unlike a standard cooler, you canNOT put ice in these things, further limiting their cooling ability. If all you want is something to keep drinks or snacks cold during road trips, then a thermoelectric cooler just might fit your needs. But if you want refrigeration for camping or boondocking, then an actual 12V fridge or standard cooler are far better choices. 3-way absorption fridges are more commonly found in RVs, and in our opinion don’t make much sense for vanlife. 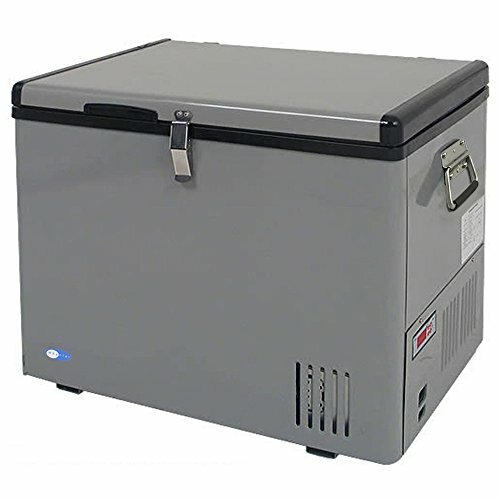 These types of fridges can run on 12V DC, 110V AC, or propane, giving you a variety of options to keep your food cold. But they’re wildly inefficient on 12V DC power, running them all the time on 110V AC means additional drain from your inverter, and running them on propane means you have more fuel lines to deal with (and you’ll have to vent the fridge to the outside). Another huge drawback is that absorption fridges need to be completely level to function properly – and unless you spend all your time in RV parks, perfectly level ground can be difficult to find. 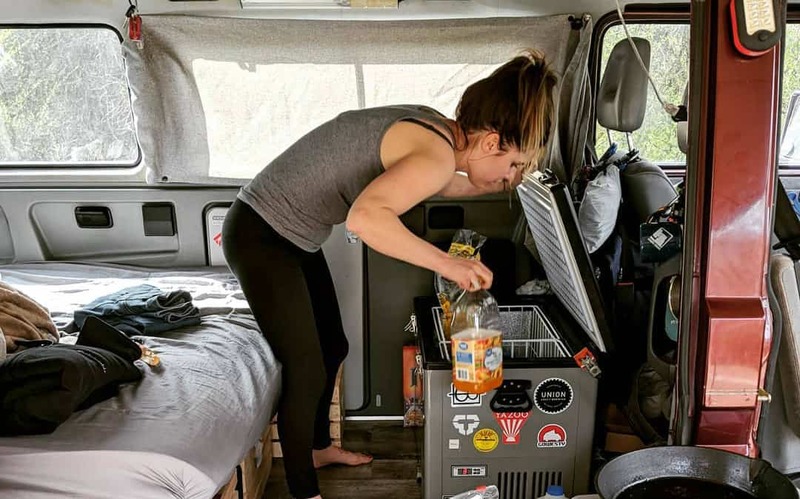 When you’re living in a van, you really need a go-anywhere fridge that’s also energy efficient, and 3-way absorption fridges just don’t fit the bill. If you’re DIY-oriented – and let’s face it, if you’re reading this blog, you probably are 🙂 – then you can potentially build your own fairly efficient fridge out of a chest freezer. Freezers tend to have thicker insulation than fridges, which means that your DIY fridge will be more efficient than a standard mini-fridge. The general idea is to take a chest freezer, plug it into a small inverter, and wire it to a thermostat that you set at fridge temperatures. The thermostat is connected to a relay that kicks the inverter on and off as needed. When the temperature inside the fridge rises above our target, the relay turns the inverter on. Once the fridge reaches the low temperature you set, the relay turns off the inverter. This prevents it from cooling too much, and also prevents power drain from leaving the inverter on all the time. The big benefit here is cost – you can make a real, working refrigerator for a fraction of the cost of a purpose-built 12V portable unit. But as with anything, there are drawbacks. These fridges will not be as efficient as 12V fridges, and you’ll have to sink some time into building this setup. You’ll also need to make sure your “fridge” stays level to ensure proper operation. 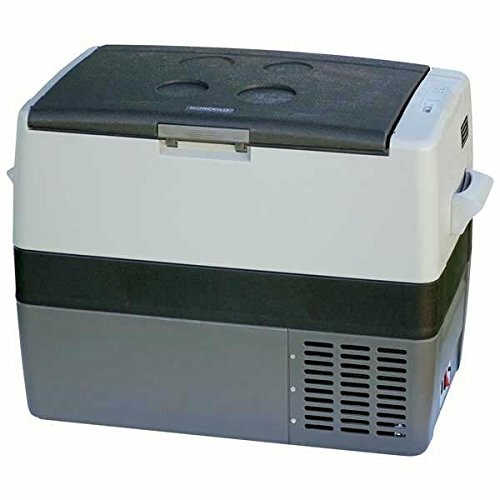 Chest freezers tend to be quite large – we couldn’t find one smaller than 3.5 cubic feet, which is twice the size of a 50 L portable fridge – so if you need something smaller for your van, you’ll have to go with an upright freezer. But the same general idea applies. In the world of 12V DC compressor fridges, there are two broad styles: top-opening chest fridges, and front-opening upright fridges. Many upright fridges run the exact same compressors as their chest-style cousins, so you would think that choosing between the two is simply a matter of how you prefer to access and organize your refrigerated food. But chest-style fridges have some big advantages over upright fridges that in our opinion makes chest fridges the best choice for off-grid campervans. Chest Fridges are More Energy Efficient. When you’re boondocking in the wilderness with your batteries and solar panels as your only power source, energy efficiency is a prime consideration. And chest fridges are generally more energy efficient than upright fridges. Why is this the case? Part of the reason is that cold air naturally sinks. With chest fridges, the door is at the top, which means that cold air will pool at the bottom of the fridge where it has nowhere to escape. But with upright fridges you’re relying on the insulation seal around the door to keep cold air in when the door is shut, and any accumulated cold air will spill out whenever the door is opened. Since food has a higher thermal density than air, most of the cold in any fridge is actually “stored” in the food (or beer) inside the fridge, so fridges that are packed full are much easier to keep cool than fridges with a lot of empty space. And with the interior shelf arrangement of upright-style fridges, it’s likely that you’ll end up with wasted empty space on top of your food items. All of this means that upright fridges have to run longer to keep your food cold, which equals a bigger drain on your batteries. If you’re used to a standard front-open refrigerator in your house or apartment, then this may come as a surprise. How can a front-open fridge with shelves and drawers be tougher to organize than a chest fridge that forces you to stack items on top of each other? The front-open fridges in stationary dwellings are huge, and give you plenty of space to spread out and organize your food items. But in a smaller van fridge, empty space is wasted space that just makes your fridge’s compressor work harder (and draw more power). Even with shelving, you still need to stack items on top of each other and you still need to shift items around to get to others. And you’ll likely end up with a ton of empty air between the top of your food and the bottom of the next shelf. All of this means wasted space without any real gains in organization. The top-down layout of chest fridges allows you to tightly pack them to fit more stuff and eliminate any wasted space. Most chest-style fridges also come with dividers and dairy compartments, which help a lot with organization. And if your food shifts around inside the fridge while you’re bouncing down those gnarly backroads, with a chest fridge you won’t have to worry about your eggs flying out at you when you get to your campsite and open the fridge to grab a cold one. Chest fridges are shaped and configured like coolers, and include handles for easy portability. This allows you to move your fridge around your van, bring it inside and plug it into 110V AC if you’re stationary somewhere, or stow it outside in cool weather for greater energy efficiency. All of this is much more difficult with an upright fridge. Many chest fridges also feature drain plugs at the bottom. These plugs make cleaning easier, but they also allow your fridge to double as a cooler if for some reason you lose electricity. Just dump ice in your fridge like you would a standard cooler, and pull the drain plug as needed to remove ice melt. This is something you just can’t do with a front-opening upright fridge. 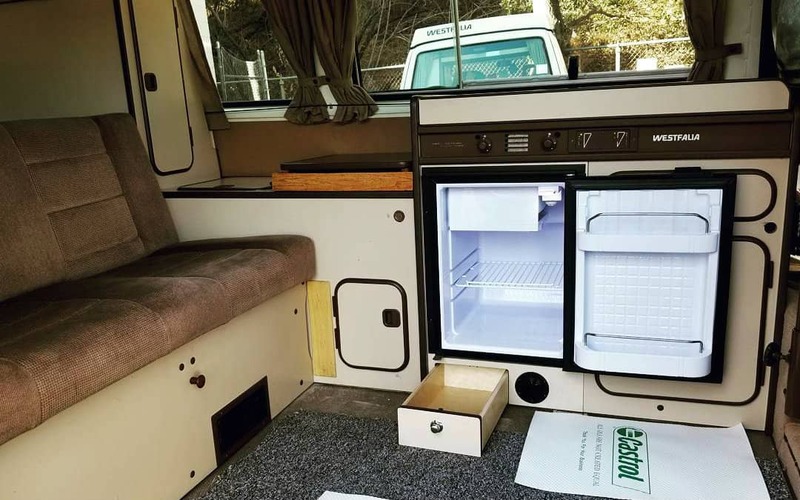 One big reason some vanlifers choose upright fridges over chest fridges is their layout. Upright fridges have a smaller footprint, which can make them easier to incorporate into a floor plan. Since they open from the front, you don’t need to make sure there’s enough overhead space to open the lid, like you do with chest fridges (to make this less of an issue, you can buy a fridge slide or make your own). But there are some things to consider when incorporating an upright fridge into your layout. First, it will likely need to be permanently mounted, whereas chest fridges are portable and can be easily moved. Also, you may have to get down on your hands and knees to see inside an upright, unless you mount it on a cabinet a few feet off the floor. With chest fridges, it’s easy to look straight down and see all the contents. 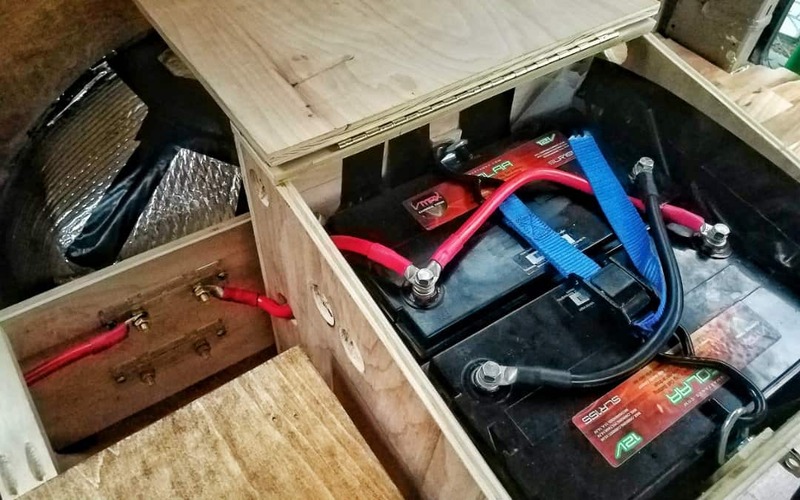 Running a 12V fridge in your van requires an electrical setup that consists of (at a minimum) a 12V outlet connected to an auxiliary battery (not your starting battery), and a means to charge it. But how much battery capacity do you need? To calculate how much battery capacity you need to reliably run your fridge, first find your fridge’s average power draw. We’ve included this info for many fridges in our massive fridge spreadsheet. As an example, let’s assume our fridge draws an average of 2.0 Amps per hour. Over the course of one day (24 hours), a fridge drawing 2.0 Amps per hour will drain 48 Ah from your battery. Since you never want to fully deplete your battery, we recommend taking your energy usage and doubling it to determine your battery capacity. So, you would want a minimum battery capacity of 100 Ah in this example – plus additional capacity for your other electrical loads. The easiest (and cheapest) way to charge your batteries is with a battery isolator, which siphons power from your vehicle’s alternator. But if your budget allows, we recommend adding a solar panel kit. We have detailed information on system sizing in our epic electrical post, but a good general rule of thumb is to match solar panel watts to battery Ah (so a minimum of 100W of solar for every 100 Ah of battery capacity). 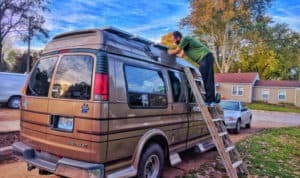 For detailed info on wiring and installing your van’s electrical and solar setup, check out our guide to DIY van build electrical! 12V compressor fridges can be pretty expensive in general, but there’s quite the range of prices between high-end brands and budget brands. If your budget doesn’t allow for a higher-end fridge (and you don’t want to use a cooler while you save your pennies), then you might want to take a hard look at less expensive brands. Just be aware that you may be making tradeoffs in terms of reliability and efficiency. If you’re a full-timer, we think a fridge is one area of your van build where it’s worth making the upfront investment in a quality unit. How much fridge space do you need? Buying a camper fridge that’s too big means spending more than you need to, and giving up more space in your van. Likewise, having a fridge that’s too small means shopping for groceries more frequently. Needs vary from person to person, but our 50-Qt ARB fridge has more than enough space for a week’s worth of food for both of us, plus a few kombuchas and a couple of six packs. Most 12V compressor fridges have the ability to function as a fridge or a freezer. But if you need both at the same time, some brands offer dual-zone fridge/freezers that have separate compartments for each. When you’re living off-grid, energy efficiency is a huge concern. Batteries and solar are expensive, and the more energy efficient your appliances are, the more money you can save in capacity (or the more time you can spend off-grid while still powering everything you need). Most 12v portable refrigerators on the market use the exact same highly efficient, variable speed compressor – the Secop/Danfoss BD35F (BD50F in bigger fridges) – although Dometic/Waeco, Engel (Sawafuji), and Whynter/Edgestar use their own units. All of the fridges we look at here are generally efficient, but some brands are able to achieve greater energy efficiency due to better insulation, configuration, and compressor controls. We list all available data on the average power draw of various fridges below. Note: It can be insanely difficult to find accurate power draw information for 12V fridges. Not every manufacturer makes test data available – and when they do, the test conditions may be different than those used by other manufacturers, making comparisons difficult. Wherever possible, we obtained test data on average amp draw directly from the manufacturers. Since all these numbers have caveats and may not be directly comparable, we’ve treated energy efficiency more as a discussion point in our analysis. But if any fridge manufacturer wants to loan us a unit to conduct our own field tests, we’ll happily oblige :). If you’ve already got a designated spot where you plan to put your fridge, you’ll want to make sure all the options you’re considering will fit. Some brands have a bigger footprint but are squatter, while others are taller with a smaller footprint. 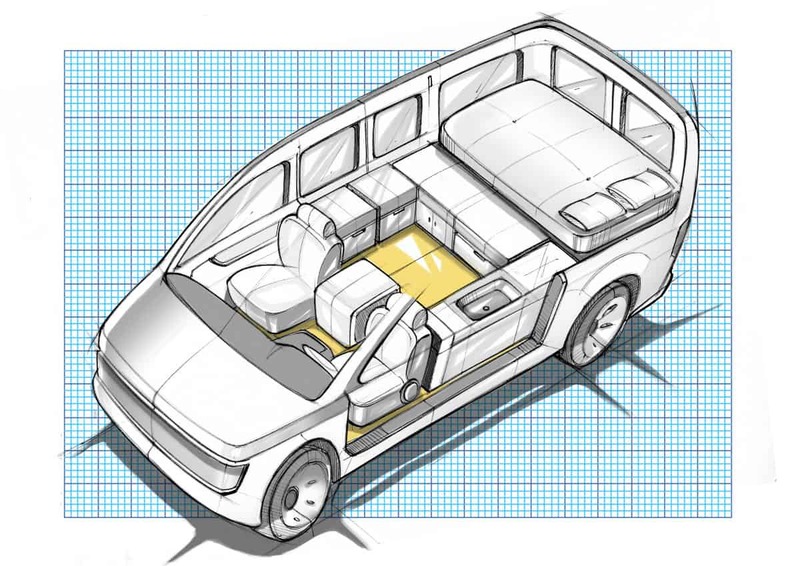 At the end of the day, whether a certain fridge will fit your van’s configuration can be the deciding factor. Weight could also be a factor in your decision if you need to move the fridge around regularly or if you’re trying to stay under a certain weight limit. We list dimensions and weights for all the fridges we looked at below. This may seem like a minor consideration, but it can make a big difference in your van set up. Some fridges have lids that hinge from the back (ARB and TruckFridge), while others have side-hinged lids (Dometic, Engel, Norcold, and Whynter). Lids that hinge from the side need less overhead clearance to fully open, and since you’re facing the fridge from the longer side it may be easier to view and reach the contents. In our van, we have our rear-hinged ARB fridge between the front seats – so having the hinge at the rear actually makes it easier for us to access everything. But every van is different, and the best lid direction for you will depend on your specific setup. Ability to operate at up to a 30° incline. LED lighting inside the fridge. Floor drain plug for easy cleaning. Low voltage cut off to protect your batteries. Dividers and lift-out organizer baskets. Some fridges include more advanced features like digital controls, remote readouts, wifi apps, and additional accessories. Factory warranties give you a degree of security in case something goes wrong and needs to be fixed or replaced. ARB and Engel both offer 3-year warranties on their fridges. Dometic and Norcold offer 2-year warranties (Dometic offers a longer warranty in Australia), while Truck Fridge and Whynter offer shorter 1-year warranties. Reputation is also a factor here. Danfoss compressors are known to be reliable, so fridges with this compressor are usually a safe bet. Dometic has a good reputation for reliability and support, and Engel’s Sawafuji swing motor is legendary for being able to run for decades without issues. Whynter is a budget brand with their own compressor, and anecdotal evidence from users raises questions around long term reliability. 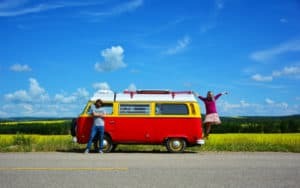 In our quest to find the best refrigerator for vanlife, we analyzed over 25 different models from six of the most popular adventure fridge manufacturers. We compiled data on average power draw, warranty, interior capacity, exterior dimensions, weight, noise level, features, accessories, and more. For the purposes of this article, we’ve focused on models with a 40L-50L capacity since this is generally the most popular size, but most of these manufacturers offer smaller and larger sizes to fit your needs. If you want to see the data we’ve collected on all 25+ models that we looked at, we’ve compiled it into a detailed spreadsheet. L x W x H 28.5" x 17.9" x 18.5" 27.75" x 14.96" x 20" 25" x 15.5" x 18.5" 23" x 13.75" x 20.5" 25.5" x 15.7" x 16.9" 23.5" x 16.5" x 20.5"
Six brands. 25+ fridge models. One spreadsheet. *By entering your email, you consent to receive email communications from us. But if you think we’re annoying, feel free to unsubscribe :-). 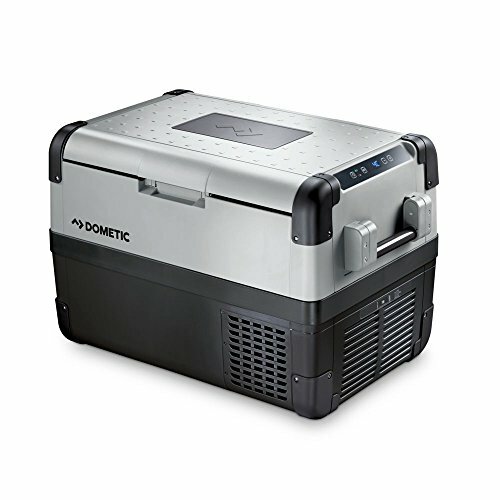 We think the Dometic CFX line of portable 12V fridge/freezers is the top choice for a vanlife fridge. 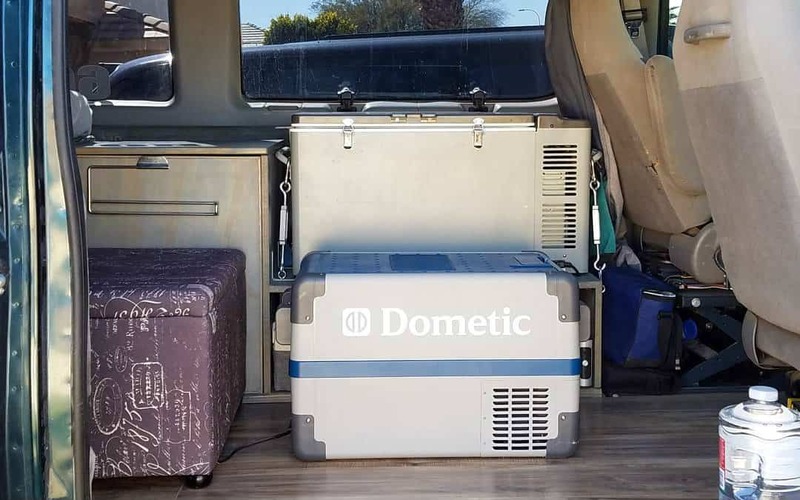 Dometic (or Waeco, as they’re also known) has always made solid fridges, but their newest models are setting the bar for portable refrigeration. CFX fridges are highly efficient and use very little power. They’re built to be rugged and durable, with solid construction, stainless steel hinges, and reinforced corners. They have advanced features, like the ability to control the temperature through a wifi app. And they’re a great value – certainly not the cheapest fridges out there, but also not the most expensive. If we were to buy a new fridge for our van today, we’d buy a CFX-50. Based on our research, Dometic CFX fridges are the most efficient that we’ve found. We were not able to find any publicly available data online, so we called Dometic directly and asked them what they had. According to Dometic’s own testing, the CFX-50 draws an insanely low 0.68A per hour on average (90°F ambient temperature with the fridge set to 39°F). Owners of this fridge generally report power consumption at or less than 1A per hour, which is consistent with Dometic’s numbers. However, the CFX-50 drew an average of 2.3A per hour in this field test from Expedition Portal. Despite the discrepancy, it’s safe to say that this is a very efficient fridge. Dometic CFX fridges aren’t cheap, but they’re also not the most expensive fridges out there. And they offer tremendous value for the price, including great energy efficiency, durability, and a slew of advanced features. In the US, Dometic offers a standard 2-year factory warranty on their products, withe option to purchase an extended warranty for up to 3 years. They offer a longer standard warranty in Australia. Dometic also has a solid reputation for reliability and support. Dometic CFX fridges are packed with features. They include more advanced features than any other fridge on this list, including a reversible side-opening lid, the ability to control the fridge settings from the comfort of a wifi app, and a usb port for charging devices. The CFX line also includes all the standard portable fridge features like low voltage cutoff, digital controls, an interior light, and a drain plug. As far as accessories, Dometic makes a fridge slide and an insulated cover for CFX fridges. This is the overall best portable refrigerator for vanlife. Low power consumption, excellent durability, best in class warranty, an array of sizes and configurations, and competitive pricing make the Dometic CFX-series fridges an excellent choice for any DIY campervan. Designed for 4×4 expeditions in the Australian outback, ARB portable fridge/freezers are known for their durability and ruggedness. They feature strong powder-coated zinc steel construction, and their very low power usage will help you keep your food cold on an off-grid solar setup. We use the 50-Qt model daily in our van, and we can personally attest to its quality and reliability. The lid on these fridges hinges from the back, making the ARB our top choice overall if you need a rear-hinged lid. The downside to these fridges is cost – they’re a bit pricier than many other 12V fridges out there. The quality certainly is there to back up the price and we wouldn’t hesitate to recommend this fridge, but this isn’t exactly a budget choice. ARB Fridges are very energy efficient, trailing only the Dometic CFX fridges (based on our research). ARB is one of the few manufacturers that makes power consumption test data readily available. According to ARB, the 50-Qt model draws a very low 0.87A per hour on average (based on a 27-hour test in 86°F ambient temperature, with the fridge set to 37°F). In a comparison test with an Engel fridge at 90°F ambient temperature (fridge set at 37°F), the ARB drew a low 1.35A per hour. We personally own the ARB 50-Qt fridge, and we can attest to its very low power draw. We’ve never directly measured it, but the compressor runs very infrequently and we’ve had absolutely zero concerns about it draining our batteries. ARB fridges are some of the most expensive we looked at. You can save a bit of money with other brands, but ARB makes top quality, rugged, and efficient fridges. You really do get what you pay for with these. ARB offers an excellent 3-year warranty, so you can be comfortable knowing that they stand by their products. We haven’t heard of any reliability issues with ARB fridges, and we’ve had zero problems with ours. ARB fridges include all the features you expect, like low voltage cutoff, digital display, interior lighting, removable lid, and drain plug. They also have a ton of accessories available, including fridge slides, tie down straps, a transit bag, and a remote display. The accessories aren’t cheap, though! Our top choice for rear-hinged fridges, ARB fridges offer excellent durability and power efficiency – two top priorities when you live in a van. They also stand behind their products with a 3-year warranty and highly-rated customer support. They do cost a bit more than other options, but they’re well worth the price and we don’t hesitate to recommend them. 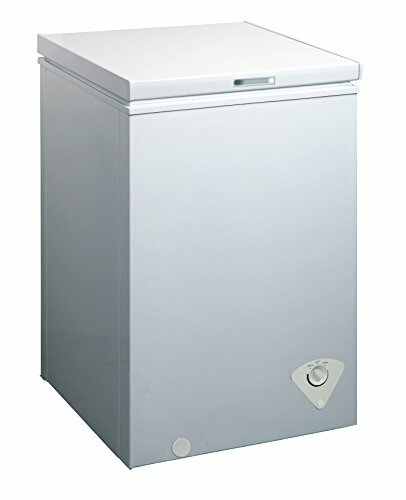 Engel fridges are legendary for their reliability and longevity – in fact, their motto is “A Legend in Reliability” – and they certainly stand up to their reputation. Engel fridges use the rock solid Sawafuji Swing Motor compressor, and many owners have run the same fridge for decades. Engel fridges draw a bit more power than our top choice Dometic and ARB fridges, but they are still very efficient. They do skimp on some features that come standard on other fridges, most notably digital temperature controls. If you buy an Engel, you’ll be using a manual control knob instead of buttons and a digital display (although, some people actually prefer this). Another downside is cost – Engel fridges are in the same high price range as ARB units, but generally have a lower capacity per dollar. We think the 40 Liter Engel MR040 is the best option for vanlife. Designed specifically for marine use, the MR040 features durable plastic construction that can weather the stresses of life on the road. Engel also makes the slightly cheaper metal-bodied MT45, another popular choice for vandwelling. 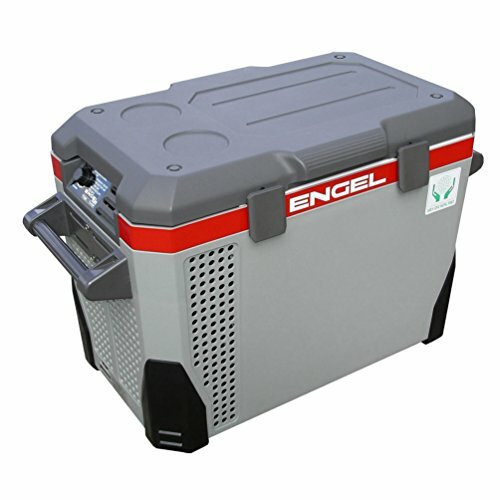 The Engel MR040 is an efficient fridge, though not as efficient as the offerings from Dometic and ARB. According to Engel’s own performance data, the MR040 draws about 1.5A per hour in 95°F ambient temperature with the control knob set to “1” (the lowest refrigeration setting). In their product descriptions for this fridge, Engel states that the MR040 “typically draws 1-2 Amps per hour,” and a comparison test run by ARB showed this fridge drawing 1.67A per hour in 90°F temps. We also found another test report indicating that the Engel draws just over 1.6A in 91°F temps, helping to confirm that this fridge reliably draws give or take 1.5A per hour in summer conditions. 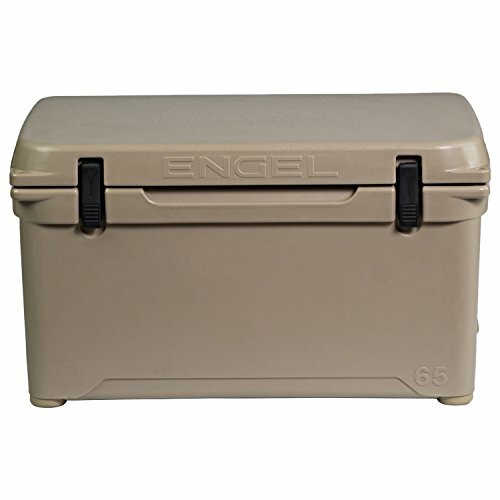 Engel fridges are on the high end in terms of price, so this is not a budget buy. And these fridges lack some features that come standard on other fridges. But, Engels are renowned for their overall quality and reliability, so even though the price is hefty it’s safe to say that this is a good long-term investment. Engel offers a 3-year warranty on their fridges, like you’d expect from a top brand. But where Engels really stand out is reliability and longevity – these fridges are legendary for lasting decades without any issues. Engel fridges are not the most feature-packed. They use a manual control knob instead of digital controls (some actually prefer this), and they do not have an automatic low voltage shut off (although the Sawafuji compressor supposedly adjusts its power draw when battery voltage is low). There are a variety of accessories available, including slides, remote displays, and tie downs. You really can’t go wrong with an Engel, especially if you want a reliable fridge that you know will last for many, many years. But Engels lack a few modern features like digital controls and low voltage shut off, and they tend to cost more than other options. TruckFridge is the American branding for IndelB, an Italian company that has been making mobile 12V compressor fridges since the sixties, and once designed a fridge for use on the space shuttle Columbia. 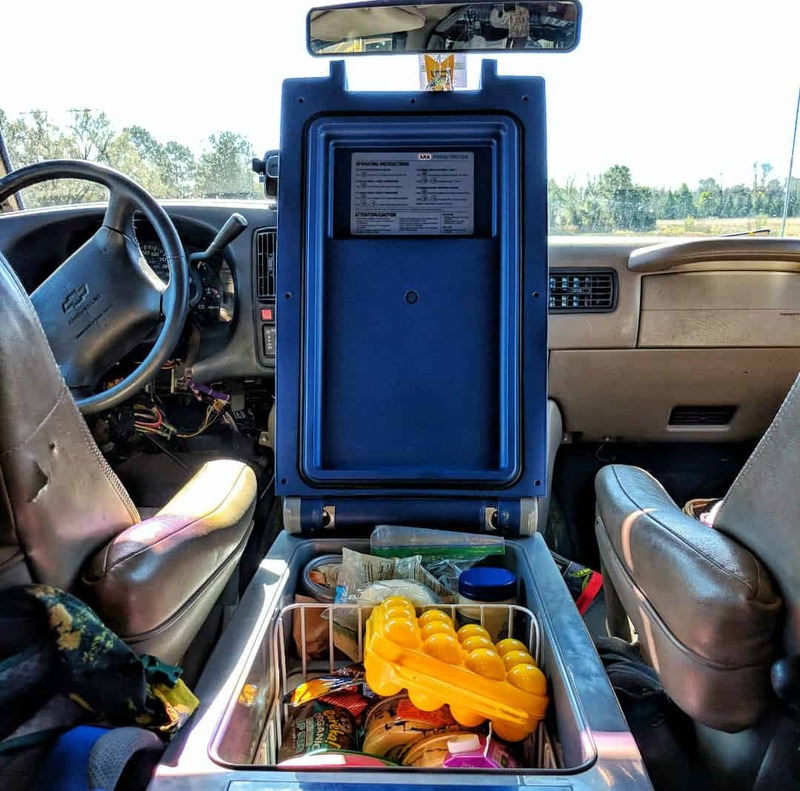 IndelB/TruckFridge has become a leader in refrigeration for truckers, and their fridges have recently been making inroads into the vanlife community as well. TruckFridge Travel Box portable refrigerators are inexpensive, full-featured units that use Danfoss BD35F compressors. The TruckFridge website looks pretty crappy, but their fridges are actually pretty good. These fridges are very energy efficient, and can compete with pricier offerings from ARB and Engel. But, they only offer a 1-year warranty, which raises some questions in our minds. And they don’t sell these fridges on Amazon, so be prepared to pay about $50 for shipping. But even with the extra cost, the TruckFridge Travel Box is more affordable than most. TruckFridge refrigerators are efficient. According to Indel B, the 50L TB51 draws a super low 0.8A per hour – although they give no indication under what conditions their tests were done. In our research, we found a detailed test report comparing an Indel B fridge to several other brands. The Indel B fridge drew about 1.6A per hour in 73°F ambient temps. TruckFridge refrigerators are a great value. These are full-featured units with Danfoss compressors, and they cost less than many other fridges out there. Indel B only offers a 1-year warranty on their fridges. These fridges do have Danfoss compressors and we haven’t heard of any reliability issues, but the short warranty is definitely something to think about as far as Indel B standing by their products. TruckFridge refrigerators include all the basic features like interior lighting, drain plug, digital controls, and low voltage cutoff. There aren’t a lot of accessories available, but they do offer a slide mount. 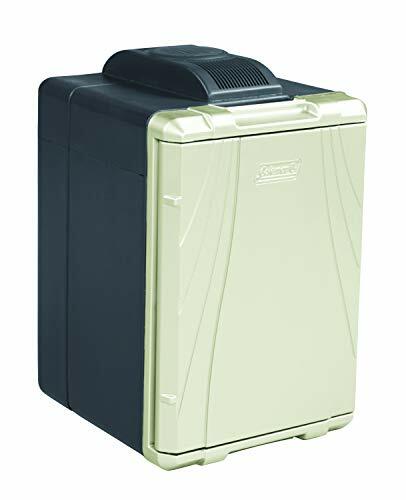 A solid, inexpensive fridge with a Danfoss compressor, the TruckFridge Travel Box is a great choice in the budget space. Norcold (and parent company Thetford) has been making marine and RV refrigerators for a long time, and the NRF-series refrigerators are their entry into the 12V portable fridge market. Norcold NRF fridges are fairly standard units that perform just fine, and do so for a lower price than many other fridges. If you can’t justify the cost of a Dometic, ARB, or Engel fridge, then Norcold is worth a look. Though you can save some money with a Norcold, you do sacrifice a bit in terms of reliability and support. Norcold fridges have a 2-year limited warranty – which is less than that offered by the three major brands – and some owners have reported difficulty getting servicing and parts from the manufacturer when they need it. NRF fridges are also not true AC/DC fridges, since they require an aftermarket converter to plug the fridge into a standard 110V AC wall outlet. All of the other fridges we looked at can natively use 110V AC power, and come with a standard 3-prong power cord. This may not be an issue for you, but we’ve found it really useful to bring our ARB fridge inside and plug it into a wall outlet whenever we’re staying out of the van for more than a few days. We could not find any information on the real world amp draw of Norcold fridges, so it’s difficult to rate this accurately. In the manual, Norcold lists the average power consumption for the NRF45 as less than or equal to 50W (4.16A). The real world average power draw is likely much lower – but it’s tough to peg a specific number without test data. 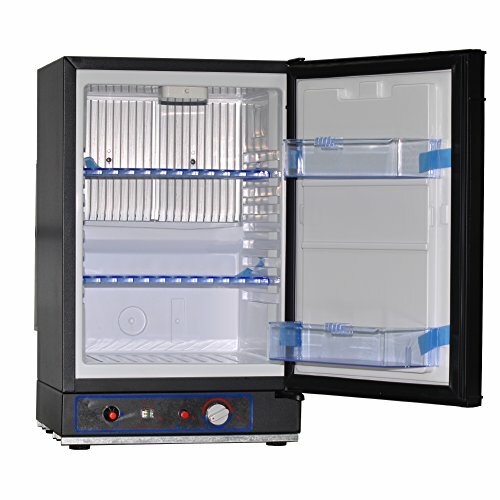 Norcold NRF fridges are priced in the budget range. You can definitely save some money with these compared to higher end brands, and their solid feature set and warranty make them a good overall value. Norcold offers a 2-year limited warranty, which is the best among the budget fridge brands. Norcold has been around for awhile as a brand, and their fridges are built by Sawafuji Electric (Engel). Norcold NRF fridges include all basic 12V fridge features, including digital controls, low voltage cutoff, interior light, and drain plug. We couldn’t find any accessories like slides or insulated covers out there, but that doesn’t prevent you from making your own. NRF fridges don’t come with an AC wall adaptor, and they require an add-on AC converter to plug into a standard three-pronged outlet. The Norcold NRF fridges are a decent budget choices that offer very good bang for your buck – as long as you don’t need accessories or the ability to power it with 110V AC. Whynter (also known as Edgestar) fridges are the least expensive that we looked at, and they’re a popular choice among budget-conscious vanlifers. The Whynter FM-Series offers portable refrigeration at a fraction of the cost of the big name brands, and with many of the same basic features. But Whynter fridges tend to be inconsistent. If you get a good one, it can be a great companion for you on the road. But there are many tales of units that break down after a few months, and of owners having difficulty getting support from the manufacturer. And while Whynter fridges are energy efficient, power draw tests and user reports tend to be all over the map, further suggesting that there may be some quality control issues with this brand. Whynter fridges also don’t use Danfoss compressors (instead, they use a proprietary knockoff), adding more reliability concerns. Many vanlifers do use Whynter/Edgestar fridges with success, and they can be a good option if you’re on a budget. But there are some question marks to be aware of here. Whynter portable fridges are efficient, but they may be a bit inconsistent. According to Whynter’s own data, their 43L FM-45G draws a low 1.10A per hour at 90°F ambient temperatures with the fridge set to 39.2°F. However, this test report indicates that the Whynter edges 3A per hour to maintain a set temperature in similar conditions. Reports from owners of this fridge are similarly inconsistent, although most users state that it draws around 1A per hour. The Whynter FM-series fridges are among the least expensive that we looked at, and they offer an incredible value. If you’re on a really tight budget, you’re getting great bang for your buck here. Just be aware that there are consistency and reliability questions with this brand. Whynter offers a short 1-year warranty on their fridges, and there are some real questions as far as consistency and long term reliability. Some owners have reported difficulty getting their fridges repaired or replaced if issues pop up. If you buy a Whynter, be sure to get it from somewhere with a robust return policy, just in case. Like most fridges on this list, Whynter’s units include all the basic features, such as low voltage shut off, interior lighting, digital controls, and a drain plug. There are few accessories available, but they do offer a transit bag. VERDICT: Decent budget fridge, especially if you need a dual-zone model and don’t want to throw down for a Dometic. But there are some real questions around reliability, consistency, and support, so beware. Portable 12V fridges are not cheap, and it’s important to know that the fridge you’re getting will fit your needs. We hope all the information we’ve presented here has been helpful – but please let us know in the comments if you have a question or you think we left something out. Even though having a 12V fridge in your van makes vanlife a whole lot easier, don’t let not having a fridge stop you from hitting the road! 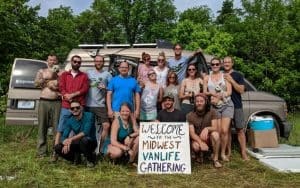 Plenty of vanlifers make it work with a basic cooler, and you can always upgrade later. 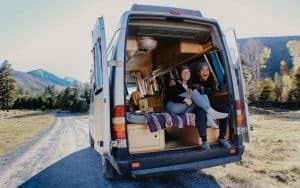 Ultimately, vanlife is not about gadgets and HGTV interiors – it’s about enjoying the freedom to create your own life. So get out there and start exploring! 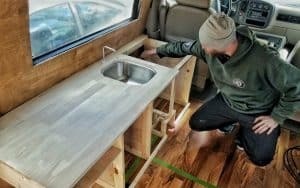 For more detailed build guides and awesome vanlife tips, be sure to follow us on Instagram @gnomad_home and on Facebook. Cheers! Hi Charly, that is correct. Dometic is a huge fridge manufacturer, and they actually manufacture units for several other brands. ARB fridges are engineered entirely in house at ARB, so Dometic has nothing to do with the design of the product, but they do manufacture them for ARB. I dont know where you guys got the warranty information.. On Amazons website for the CFX50 that you recommend, it says the warranty is 1 year on the compressor and 2 years on parts. Its a poor warranty from what I am reading and a lot of money for their product! Anyone have specs on the TruckFridge65 as far as incline? I have an app on my phone to measure it so was going to see when I should shut it off. I’ve looked all over Al Gore’s internet and nothing. Portables claim 30deg. What about fixed? Specifically TF65? Thanks! My VW Eurovans fridge got put out to pasture. Can’t be happier with the new TruckFridge TF65. I am between the Dometic and the ARB, which one do you think runs quieter? I am sensitive to appliance noise and want the quietest one so I can sleep next to it. Thank you! Just a quick note to say that this is the best article and review for On The Road refrigeration that I have seen. Thank you! Hi Bob, thanks for the kind words! Our goal is to be the most helpful resource out there for nomads, so if you have any suggestions for improvement feel free to let us know!